This post may be shared with some or all of the following link-ups: The Art of Home-Making Mondays, Modest Mom Monday's, Homestead Barn Hop, Monday's Musings, Titus 2sdays, Titus 2 Tuesdays, Teach Me Tuesday, Raising Homemakers, Make Bake Create, Wise Woman Link Up, Christian Homemaking, Wow Us Wednesdays, Wildcrafting Wednesday, The Scoop, So Much at Home, Homemaking Thursdays, Hearts for Home Thursdays, Growing in Grace Thursdays, Home Acre Hop, From the Farm Blog Hop, Farmgirl Friday, Front Porch Friday Blog Hop, Simple Meals Friday, Cultivate Nourishing and Clever Chicks Blog Hop. Thank you lovely ladies for hosting these. Thanks for inviting me to link up with you - I've been a reader for a long time, but for some reason I've never thought to link up - definite hand hitting head moment here!! I thank you for visiting my blog last week! I am excited to be posting here for the first time (Speech Therapy and Laundry)...ok, two posts :-) I love your blog. I have been reading here for about 5 months and have gained so much encouragement and knowledge!!! Hello Jes! I am still on holiday but I wanted to stop in and say hello! It has been a lovely refreshing trip so far! I know you had a wonderful 4th of July. I will be linking up next week! Hey Jes.... I was just wondering what you know about the pic of the family praying that you have posted? I have that picture... it is a large one.. framed in a beautiful wide old frame.. I would love to know if you know anything about it.. Thanks for your wonderful Monday link up...I appreciate your time and effort in making this available.. Blessings! I couldn't have said it better Pamela, thank YOU for sharing! I just linked. I'll be around to read the others and your posts. Have a great week. Thanks for sharing the linky and your wonderful blog. You Bless. Thank you for joining in the fun! Have a wonderful week! First time visitor here! Thank you for the opportunity to link up my blog post. I blog about marriage every week ~ Marriage Monday! 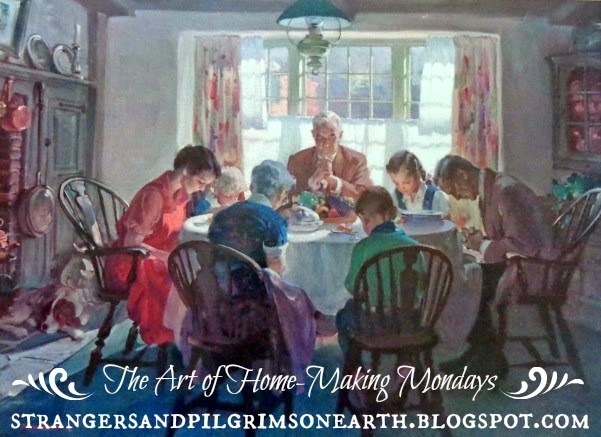 I think my post for this week is a perfect fit for your Homemaking Mondays link up!